Veena Gayathri is a household name with a celebrity stature in any musically literate home in India and abroad. Veena Gayathri was born on 9th November 1959 to Smt. Kamala Aswathama, a veteran veena vidushi and Sri G. Aswathama, a popular film music director of telugu cinema. When Veena Gayathri was a toddler, her father noticed a popular phenomenon in her when she used to stamp her feet on the floor and sway the anklet bells in tune with any rythmic beat she happened to hear. Her father realized the prodigy in the child. She developed an unconscious attachment to veena and started playing on it for hours together unobtrusively in the pooja room. But if there was any intrusion or disturbance during her veena Sadhana, she used to burst into tears and cry. Her father then started coaching her in manodharma and mother trained her in the intricacies of veen techniques. This is how to veena Gayathri blossommed into a veena artiste at an unimaginably tender age of 6. She launched her eventful and illustrious career by making her debut in giving veena concert in Karpaga Vinayagar temple in R.A.Puram. During the year 1968, when Sri Parthasarathy Swami Sabha, Triplicane invited her to participate in their Saint Thyagaraja Festival she was a child prodigy who was hardly 9 years old. Her performance was a resounding success in front of a huge audience of musicologists and experts. Prof. P. Sambamurthy the renowned musicologist instantly hailed veena Gayathri as child prodigy. This was her maiden stage performance which not only got her adulation, accolades and econiums but also launched her on a long and fulfilling musical journey. Subsequently in the year 1970. She gave another concert in Sri Parthasarathy Swami Sabha again on public demand. She had never looked back from then on. During her childhood days she was well-known as Baby Gayathri. Her penance on veena for years and years has naturally given her the name Veena Gayathri implying that veena is synonyms with Gayathri and Gayathri is the embodiment of veena. Her admirers who have been enraptured by her melody, bhava purity of sahithyam, thala suddham, layam and lakshanam constitute a great majority of music lovers all over the world. 1) Veena Gayathri also had her advanced training under the expert guidance of Sangita Kalanidhi Sri.T.M. Thigarajan for 10 long years. According to her, the scintillating performance which she gave in the immediate divine presence of Jagatguru Sri Chandrasekarendra Saraswathi of Kanchi Kamakoti Peetam (reverentaially known as » Maha Periyava » at the age 11 had enhanced the innate divinity in her veena playing Maha Periyava Presented to veena Gayathri a sandalwood crown with « OM » engraved on it and asked her to wear it on her head. His Holiness blessed Veena Gayathri while she played with the crown on her head. 2) Veena Gayathri has performed in many parts of the world such as, USA, UK, Malaysia, Singapore, Sultanate of Oman, France and Germany. She was invited to perform in the Festival on India celebration in Paris, France and Sri Lakshmi Narayana Global Festival in Berlin, Germany in the year 2002. 3) Veena Gayathri had also worked with almost all leading music directors of the South Indian Film Industry for nearly two decades. 4) The Golden Jubilee Celebration of Independence of India at Chennai in 1997 had the BBC sponsoring her veena concert. Mr. Mark Tully of BBC compered the programme and her inimitable performance endeared her to both the Indian and foreign dignitaries who comprised the audience. 5) She is a veena artiste who had been exploring innovating and discovering new frontiers of music through veena. She has released innumerable albums and CDs and they have all records in the sale of titles in instrumental music. 6) Her adroitness, dexterity, and perfection in handling each and every theme on Veena, right from Carnatic music to ghazals, Jazz, fusion, pop, folk etc have made her the most versatile veena vidushi we have in the field of Carnatic Instrumental Music today She is the favourite artiste of the connoisseur of Carnatic music as well as the commoner. 7) Dinamani, one of the leading regional news papers had hailed her as « BOOMIKKU VANDA SARASWATHI » meaning the goddess of Arts « Saraswathi having descended on earth in the form of Veena Gayathri. She has also performed in various festivals organised by learned vedic scholars and pandits. 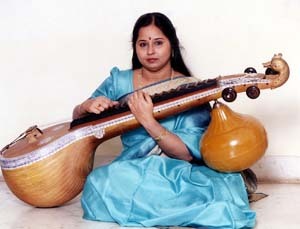 She is proficient in playing the « sookthas » and « Mantrapushpam » on the veena. 8) Despite many accomplishments and awards her vision and mission are to visualize spiritualism and experience divinity through veena and reconfirm the belief that veena yoga is definitely one of the means to attain soul-elevation and for eternal communion with the Absolute. Her veena playing is an attempt to reach Para Brahmam through Nadha Brahmam. 9) The delineation of Raga and thanam the musical contours she traces through her fingers, the tonal modulation, shown by her constant shuffling of hands, the crescendo effect transition from the depths of hush, the effortless ease with which she plays lead one to believe that she energises the veena strings and breathes music into them through her Adhara Chakras with the flow of Kundalini Sakthi. 10) Her raga alapanas are always oscillating between the Octave scales in a measured manner, crisp and overflowing with captivating grace and alluring gravitational pull. She is one Veena Artiste who can make her instrument sing the Sahityam in its pristine purity like a seasoned Vocalist. « Yazh Isai Selvi » – bestowed by Dr.Visalakshi Nedunchezhiyan in 1971. Senior Grade-awarded by All India Radio at the age of 13; without audition in recognition of prodigious talents, in the year 1973. « Outstanding Youth Award » – by Jaycees – Coromandel in the year 1976. « Nadhasudharnava »- by Dr.M.Balamuralikrishna in the year 1983. « Kalaimamani » – awarded by late Dr.M.G.Ramachandran on behalf of the government of Tamilnadu in the year 1984. « Ugadi Velugu » – by Dr.P.C.Alexander on behalf of Madras Telugu Academy in 1987. « Top Rank » awarded by All India Radio in 1991. « Isai Peroli » – awarded by Dr.M.S.Subbulakshmi on behalf of Kartik Fine Arts, Chennai in the year 1996. « Veena Nada Mani » – awarded by the Kanchikamakoti Peetham in 1997. « Kumara Gandharva » – by Sri.Digvijay Singh, former Chief Minister of Madhya Pradesh on behalf of the government of Madhya Pradesh in the year 1999. « Sangeetha Vainika Sikhamani » – by Andhra Cultural Association,Chennai in 2000. « Sapthagiri Sangeetha Vidwanmani » – by Thyagaraja Utsava Committee ,TTD Devasthanam, Tirupathi in the year 2000. « Sangeetha Kala Sikhamani » – awarded by the Indian Fine Arts Society in 2001, December. « Sangeetha Kala Saraswathi » from Smt.M.S.Subbulakshmi om behalf of Symphony recording company on the eve of the release of « Sri Venkateswara Suprabhatam » on veena. « Bala Ratna » from Sri Balatripurasundari Temple, Nemili in 2002. « Sangeet Natak Akademi » award – bestowed by the President of India, Dr.A.P.J.AbdulKalam in the year 2003. Appointed as the « Asthana Vidushi » of Sringeri Math in 2003. Appointed as the « Asthana Vidushi » of Sri Kalahasthi temple in 2003. « Ambassador of Peace » – awarded by the World Temple of Peace , Chennai in the year, 2003. « Sri Jayendra Saraswathi Peetharohana » award – by Kanchi Kamakoti Peetham in the year 2003. « Hanumath Gana Siromani » – awarded by Maruthi Bhaktha Samajam, Nanganallur, Chennai. « Asthana Vidushi » of Sri AnanthaPadmanabhaswamy Temple, Chennai. « Asthana Vidushi » and committe member of Sri Ratnagireeswarar Temple. Recipient of best senior Veena artiste award from The Music Academy, Chennai many times. She received the Prestigious « Sangeetha Kala Nipuna » from Mylapore Fine Arts Club in the year 2004. Member of Carnatic Committee, ICCR(Indian Council For Cultural Relations) -2002-2005, New Delhi. Member of Tamil Iyal Isai Nataka Manram (2002-2005), Tamilnadu Government. Member of faculty for fine arts, Annamalai University (2002-2005). Member of advisory board of Sri Thyaga Brahma Mahotsava Sabha, Tiruvaiyyaru. She received the prestigious title, « Sangeetha Kala Nipuna » from Mylapore Fine Arts Club in the year 2004. The child prodigy, Baby Gayathri, collected a record crowd for her veena recital at the Music Academy yesterday afternoon. The loud chatter of admiring « rasikas » deafened the ears. Many had to leave the auditorium in desperation and feel satisfied with feeble strains of « Todi » that floated in the air about a furlong away. – The Mail,Madras,1970. Captivating veena recital by a child. – Indian Express,1970. Enchanting Veena Recital by 11 year old – It was an electrifying experience. Over a thousand strong audience were overwhelmed by the prodigal talent displayed by Gayathri under the auspices of Sri Shanmukhananda Sabha. Tremendous control over « laya » and divine « nada » were strikingly evident through out the concert. – Times Of India,Bombay,1971. Incredible but true is how one could describe this little girl’s concert. – Free Press Journal,1971. Child wonder, Gayathri excels again. – Indian Express,1971. « It was a language of God »-that’s how people who have witnessed Baby Gayathri’s performance, quipped. – The Deccan Chronicle,Secunderabad,1971. The noted child prodigy ,Veena Gayathri enthralled the audience at her concert for the Indo-Canadian association. – The Canadian India Times,1976. She is considered as one of the top musicians in India ,though very much in her teens. – Womens Era,1976. India’s wonder girl,Veena Gayathri is billed as India’s top Veena player. – Kualalumpur,1979. GAYATHRI SPARKLES-Well-known 15 years ago as Baby Gayathri,this prodigy has evolved into a top vainika. – Indian Express,1981. Top musicians, Zakir Hussain, Chitra Viswesvaran, Veena Gayathri, Vikku Vinayakaram,N.Ramani to perform… – New Sunday Times, Malaysia,1991. « Boomikku vanda Saraswathi » – Goddess Saraswathi has arrived on earth. – Dinamani, Leading Tamil daily. From beginning to end Veena Gayathri’s concert was a steady flow of divine nectar. -Newstoday,1997. Her lyrical mode of expression paid homage to subtilelities and sensitivity. – The Hindu,1999. Listeners normally served with humdrum veena performances were taken to a higher level of beauteous perspective by Veena Gayathri’s intuitive sensitivity to the sound of the veena. The Hindu ,2000. It is superfluous to admire Veena Gayathri’s experise; her expert fingers could easily touch any note of subtle music with incredible perfection. – Indian Express,2004. GOLDEN MOMENTS ON VEENA-The destiny of child prodigies is rather unpredictable-they rise like a meteor and fade like a shooting star, not so Veena Gayathri, who has held centre stage for several years now. According to her ,the scintillating performance which she gave in the direct divine presence of Jagath Guru Sri Chandrasekharendra Saraswathi of Kanchi Kamakoti Peetham (reverentially known as « Maha Periyava ») at the age 11 had enhanced the innate divinity in her veena playing. Maha Periyava presented a sandalwood crown with « OM » engraved on it and asked her to wear it on her head. His holiness blessed Veena Gayathri while she played with the crown. She has also had the unique privilege of giving exclusive concerts in the immediate presence of the following saints, savants, sages and siddha purushas. On the family front Veena Gayathri was married to a Marine Engineer, Sri E. Rama Krishna in the year 1979. Her husband had also worked as Vice President of a reputed shipping company. She has two daughters, Deepta and Harita. Deepta is working in Cognizant Technology Solutions. Harita is studing for M.S. (Power Electronics) in A & M University, Texas. VERY BIG archives … !